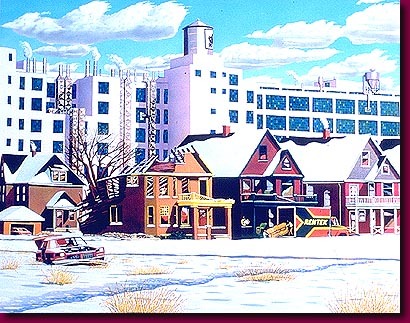 Fisher Body Plant 21 was in its last days when I made this painting of it in the mid - 80's. Its dominating presence over the foreground of houses, no doubt inhabited by some of its past workers, is metaphoric of its control over their fate. As it declined and became abandoned, so did they.